For most learners, listening comprehension is one of the most frustrating parts of the English learning process. People all around the world work hard to learn to read, write, and speak, but for a number of reasons, listening is something they never get the hang of (learn to manage). Actually, it’s something most people totally ignore, or don’t know how to deal with. As we discussed in part I of this text, Secret Tips to Drastically Improve Your English Listening, the best way to do this is through consistent, engaged, firsthand experience of the English language. The ability to listen in English demands a special set of skills that cannot easily be taught. Fortunately, with dedication and good strategies, listening skills are relatively easy to develop, and it’s one of the quickest and surest ways to upgrade your English fluency. It will also open the door to the vast world of English speaking media. The good news is that although it’s one of the most frustrating parts of English, it’s one of the easiest to fix. With a few small adjustments, you can drastically improve your listening comprehension in just a few months. RLE’s objective is to provide you with a roadmap to make English listening a fun, natural, and convenient part of your daily life. This is key to lifelong fluency. Reading Along with Transcripts and Audiobooks. Today we’re going to go deeper. Whether it’s a real life interaction with another person (or a group), or you’re listening to a podcast, or watching TV, try your best to focus on the general idea. Accept that you probably won’t understand everything. It will get easier with time and consistent effort. A common myth that language learners have about the target language is that fluency means that you understand 100% of what is being said. Well, I’m a native English speaker, and there are times when I don’t understand what other people are saying. Does that mean that I’m not fluent? My advice to language learners is to be patient with your listening comprehension, relax and try to understand the main idea. The more consistently you make the effort to just stay present and listen, the stronger the context for understanding the details will be. The cold hard truth is that most people are not very good listeners in their native tongues. If you aren’t able to deeply listen to what others are saying in your native language, how can you do it in a second language? In 7 Habits of Highly Effective People, Stephen Covey explains this perfectly in Habit 5: First understand, then be understood. If you haven’t read this classic book on self and professional development, I highly recommend it. Watch a summary here! Just like any language, native English speakers use the language very very differently than the way you were taught in school. This is nothing against English courses, many of which are doing a great job preparing students with a foundation for fluency. The problem is that the colloquial/slang part of the language is nearly impossible to map, study, and teach using traditional methodology. Beyond that, a lot of grammar purists and academic minded people don’t even recognize this as a relevant part of the language. If you’re interested in learning real life English, this is a big limitation. Going to (Future)= GONNA–> I’m gonna go to the movies tomorrow. Want to= WANNA–>I wanna learn more English. Got to (I’ve got to/I have to)= GOTTA–> I would love to stay, but I gotta go. Scientists say that 50-80% of all communication is non-verbal body language. What this tells me is that the cultural aspect has HUGE importance here, and that as non-native participants of a different culture, we should really learn and pay attention to what body language communicates. We must listen deeply! There are many English speaking cultures with different body language, but I know that after a few years living in Brazil I can see that body language is really different compared to my native culture (U.S.A.). One small but strong examples is that people stand a lot closer in Brazil and the personal space is much more important in the United States. I know this is common in other latin countries too. Another aspect of the English language that will improve your listening abilities (in-person interactions) is to know your survival phrases perfectly. What are survival phrases? They are Basic questions that communicate when you don’t understand something, when you need to ask about a word. People disengage from conversations way too often because they don’t know how to communicate that they don’t understand appropriately. Believe it or not, most intermediate and a lot of advanced speakers have problems with these. The main reason for this is not because they don’t speak English well, but rather because of tone and subtle cultural aspects of communication. For example, when a Brazilian doesn’t understand something, they often say “what?” or “I didn’t understand,” which are both correct grammar, but culturally they are generally incorrect don’t facilitate high levels of communication. Note: If you still don’t understand after number 1, ask number 2, and so on. Another extremely useful phrase: What does ___________ mean? (NOT “what means __________?) When you don’t understand something when you are reading or listening, you can ask for clarification. There are more you should know, and this deserves its own article, but this is a good start. To be a good face to face listener, it’s important to be proactive about your own communication and clarify what the other person is saying. The final listening tip is to learn how to understand (and use) discourse markers at a really high level. Most people don’t know what these are, but they are essential for communication. Once you learn this small handful of words, you’ll see and hear them everywhere. Well: Well, I can’t hang out with tonight. I’m a little tired. So: So, what are you planning to do tonight? Look: Look, I think we need to talk. Kinda (Kind of): I’m kinda tired tonight. Like: He’s kinda like my best friend. Alright: Alright, look, so I’m gonna help you out. You Know: I’m not a bank, you know (ya know). I an’t loan you money. Anyway: So, anyway, after that happened, I decided to learn English. Actually: Actually, in Brazil they speak Portuguese, not Spanish. Now: Now look, I’m not looking for trouble. Just take my wallet. You have them in your own language for sure, and you wouldn’t feel comfortable communicating without them. Just the same in English, you must understand them and learn to use them for advanced fluency. The problem is that, although they are easy to learn with the proper experience, they are rarely being taught. 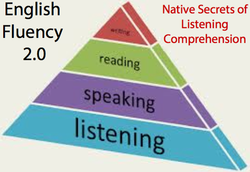 This concludes this two part series on the importance of listening comprehension for developing fluency. If you haven’t read it already, I recommend the first article in this series, Secret Tips to Drastically Improve Your English Listening. What fun, convenient daily habit can you cultivate to improve your listening? What are your biggest listening difficulties? What strategies and techniques have worked for you? We would love to hear what you think. I think that communication is actually more important than just being able to understand. 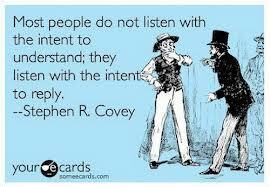 It’s not only listening, it’s being able to RESPOND intelligently. But there are a lot of good tips here to help language learners become better at listening in order to communicate better in English eventually. Great job! Yeah that’s important too, but that’s another article, right? Communication requires that the communicating parties share an area of communicative commonality. The communication process is complete once the receiver has understood the message of the sender. So, the first step to RESPOND intelligently is UNDERSTAND the subject… I mean, what is being said. I totally agree, Elton! It’s a complex topic that is worthy of our attention. What you said was one of the main points I was trying to convey.